BONE MARROW DEVELOPMENT. The hematopoietic stem cell that gives rise to all formed elements of the blood has a peripatetic life cycle. It travels to multiple sites as embryogenesis provides appropriate microenvironments. Early in development, stem cells located in the dorsal mesentery near the primitive aorta migrate through loose connective tissues to the yolk sac. The progeny rapidly divide and develop into precursors of erythroid, myeloid, monocytoid, lymphoid, megakaryocytic and endothelial cell types. Hematopoietic, lymphoreticular and endothelial cells are interdependent and intimately associated as they divide and differentiate within the organizing yolk sac. Blood cells undergo multiple obligatory interactions with endothelial cells and stromal components as they travel from the yolk sac to new sites of hematopoiesis or as they enter and leave the interstices of non-lymphoid tissues. The location of hematopoiesis shifts from the yolk sac to the developing liver where clonal hematopoietic colonies expand in close proximity to endoderm-derived hepatocytes and sinus lining cells (Rossant et al, 1986). The liver remains the major site of fetal hematopoiesis until shortly before birth when stem cells travel by blood to the spleen that supports hematopoiesis until vascular invasion of cartilaginous bones begins the process of ossification and formation of marrow cavity. Population of the developing marrow may be facilitated by chemotactic and growth factors released from bone matrix and connective tissue cells. The bone marrow remains the primary site of hematopoiesis in adults until death, although some hematopoietic stem cells in connective tissue of the abdominal mesenteries can be induced to form hematopoietic colonies by cytokines released during inflammation. It is possible that the initial development of the blood-forming tissues, migration of stem cells and hematopoietic precursors may be controlled by receptor-ligand interactions and cytokines which regulate the entry, survival, proliferation and differentiation of hematopoietic progenitor cells. ADULT BONE MARROW. The bone marrow is the site of origin of all T- and B- cells, mononuclear phagocytes, platelets, erythrocytes, and other leukocytes in the adult. The aggregate volume and weight surpasses that of the liver. The bone marrow is divided into wedge-shaped hematopoietic compartments filled with proliferating and differentiating blood cells in connective tissue matrices bordered by venous sinuses. Monoclonal antibody-detected phenotypes and reactions for enzymes expressed at stages of differentiation show progressive hematopoietic cell maturation from immaturity in areas near bone to full differentiation at the vascular interface. Radial venous sinuses that merge with a central longitudinal vein are major components of mouse bone marrow structure. Blood cells complete maturation immediately adjacent to the dilated vascular channels into which they will emigrate. The microenvironment of the bone marrow is produced by a unique endothelium and connective tissue stroma combined with locally deposited cytokines that regulate compartmentalization, proliferation and differentiation of hematopoietic stem cells. Adventitial cells lining the interstitial side of venous sinuses extend cytoplasmic processes into the hematopoietic compartment, making contact with numerous cells. Stromal cells are essential for regulation of hematopoietic cell development. In situ hybridization with probes for allotypic markers proved that stromal cells are capable of transferring the hematopoietic microenviroment of the donor after allogeneic bone marrow transplantation. One way marrow stroma assists hematopoiesis is through the glycosaminoglycan-rich extracellular matrix that binds and distributes growth factors such as granulocyte-myelocyte colony stimulating factor (GM-CSF). The vascular system of the marrow is anatomically closed with little leakage. Mature cells are transported from interstitium to venous sinus through cytoplasmic apertures in the endothelium. Location of immature cells at sites far removed from the venous sinuses requires that maturing cells acquire sufficient motility to approach the blood vascular interface. Accidental release of cycling hematopoietic cells is prevented because motility is suppressed during cell division. Tidal blood flow through dilated venous sinuses gently supports peripheralization of hematopoietic cells that leave marrow compartments to lodge in other environments as soon as they are able. The marrow monitors and controls release of hematopoietic cells to the periphery by mechanisms that are still unknown. Noradrenergic nerve fibers penetrate into the bone marrow with arteries and follow them deep into regions within the cellular marrow adjacent to the central venous sinus. A few fine varicosities branch from the perivascular plexus to supply aggregates of hematopoietic cells that lay within areas of marrow close to venous sinuses. Little is known of the function of bone marrow innervation outside of its assumed role in controlling blood flow. B-CELL DEVELOPMENT IN THE BONE MARROW. The bone marrow generates cells with immunological diversity for the lymphatic system. B-cell development begins in the liver and continues in the bone marrow as maturation progresses. During maturation from the primordial stem cell, B-cell progenitors contain cytoplasmic IgM. These cells do not express this protein on their surfaces although they share another surface antigen with mature B-cells. Shortly before birth, lymphocytes with detectable surface IgM appear in bone marrow and this is followed by the appearance of other cells bearing both IgM and IgD on their surface. Antigen specificity of precursor B-cells is determined by germline genes encoding the variable and hypervariable regions of the immunoglobulin light and heavy chains expressed the membranes of "precursor" B-cells. Isotype committment has not yet occurred and each cell contains a complete set of immunoglobulin heavy chain genes for mu through alpha. The IgM+/IgDI small B-cell that leaves the bone marrow is metabolically "mature" in that it is antigen-specific, circulates in the blood and is a significant component of the recirculating pool, but it is considered a "primary" B-cell until it "switches" its membrane immunoglobulin to another isotype. See this site for Flash Animation of B-Cell Maturation. B-cells are more susceptible to tolerance induction by antigen or anti-immunoglobulins when they are in early stages of differentiation. Injection of antibodies directed against isotypic, allotypic, or idiotypic determinants of immunoglobulins in immunologically immature animals can lead to long-lasting inactivation of clonal precursors of B-cells bearing these proteins on their surfaces. This tolerant state is readily produced when the maturing B-cells express only IgM, and is more difficult to achieve after IgD is expressed. The precise mechanisms of tolerance induction following antigen or antibody exposure are unknown and theories of clonal deletion of T-cell suppression abound. DEVELOPMENT OF THE THYMUS. This lymphoepithelial organ develops from ectoderm derived from the third branchial cleft and endoderm of the third branchial pouch including mesenchynmal components derived from cells of the cephalic neutral crest which all migrate from the neck to the anterior mediastinum. The rudimentary thymus enlarges in successive waves as lymphocytes and hematopoietic cells emigrate from embryonal blood vessels to infiltrate spaces between plump thymus epithelial cells. Proliferation and entry of new lymphoid precursors distend interepithelial spaces, resulting in densely packed clusters of lymphocytes in a desomsome-linked epithelial cell reticulum. Chemotactic peptides elaborated by thymic epithelial cells and/or mononuclear cells are believed to initiate immigration of circulating lymphocytes to the developing thymus. Population of the thymus with lymphoid cells occurs in three discrete 24-36 hour waves separated by refractory periods temporally expressed receptiveness or periodic release of chemotactic factors by thymic epithelial cells regulates population of the thymus. Development and maturation of T-cells is under the influence of the epithelial and mesenchymal stroma. The epithelial cell stroma exhibits regional specialization with regard to structure and expression of antigenic markers. The mesenchymal stroma consists primarily of mononuclear phagocytes, Langerhans-like cells and unusual cell types like the rhabdomyocyte which appear to represent anatomic and antigenic stereotypes of normal host cells. Interaction of precursor T-cells with these various stromal elements presumably determines whether immunoreactivity or tolerance results. THYMIC MICROENVIRONMENTS. The epithelium of the thymus undergoes progressive keratinization and maturation like the skin. The epithelial reticulum of outer cortex, inner cortex, corticomedullary junction and medulla is distinguishable by monoclonal antibodies that bind cytoplasmic keratins of different molecular weight. Subcapsular thymic epithelium contains less mature keratin while the most mature keratin is found in Hassal's corpuscles in the medulla. Lectin binding patterns in the thymus also indicate cortico-medullary maturation. Taken together, the epithelium of the thymus may not be static but turns over continuously like the epithelium of the skin. The Hassal's corpuscles are filled with whorles of keratinized epithelium, leukocytes and debris. They may be internal sites where exfoliated epithelium is endocytosed, degraded and carried away by leukocytes. Thymic epithelial cells have immunomodulator and neuroendocrine functions which effect T-cell function inside and outside the thymus as indicated by the ability of thymic implants in diffusion chambers to reconstitute T-cell immune functions in thymusless mice. Granular deposits of IL-l are present in thymic cortical epithelial and/or mononuclear cells. Thymosin Al and serum thymic factor are detected in both cortical and medullary epithelial cells, whereas thymosin B3 has been found only in the cortical population. Hall suggests that there are bidirectional circuits between the central nervous system and the immune system. Thymosins, interleukins, complement components, enkephalins, adrenocorticotropic hormones and thyroid stimulating hormones present in thymus cells produce neuroendocrine effects on both systems. Thymic epithelial cells express class II MHC antigen, in three basic patterns. The subcapsular epithelial layer is class II negative. The remaining cortex, including the thymic nurse cells, is strongly class II positive in a reticular pattern that extends from the outer cortex to the corticomedullary border. The inner membrane of thymic nurse cells is strongly positive for class I as well. The medulla is densely class I and II positive but it is uncertain that class II is expressed on the spatulate epithelial cells because treatments that deplete bone marrow derived dendritic cells renders the medulla class II negative. Dendritic cells of the donor's class I and II allotype are present in the medulla by three weeks following bone marrow reconstitution while the cortical reticulum retains that of the host. All cells in the thymus express MHC class I antigens but the highest expression is on nonepithelial cells. Although self/non-self education and acquisition of haplotype restriction of developing T cells requires intrathymic expressed MHC antigens, it is not known whether MHC+ epithelial cells or MHC+ mesenchymal cells contribute equally or not. THYMIC MESENCHYMAL STROMA. Macrophages, Langerhans-like dendritic cells and perivascular reticular connective tissues comprise the mesenchymal stroma of the thymus. Macrophages are distributed throughout the cortex and medulla with a slight increase in density at the corticomedullary border. Immunohistology and enzymatic reactions reveal heterogeneity among thymic mononuclear cells. Nonspecific esterase-positive cells are more prevelent in the medulla but rare scattered cells are present in the corticomedullary junction and cortex. Few of the esterase-positive mononuclear phagocytes and some of the medullary macrophages contain phagocytosed nuclear debris and periodic acid Schiff (PAS) positive granules. Acid phosphatase-positive cells are concentrated at the corticomedullary junction, the location of dendritic cells. These cells express class I and II MHC antigens and stain positively with the OKt-6 monoclonal which labels Langerhans cells in skin. Although Ia-antigen bearing epithelial cells may be important for T-cell development, it is the nonepithelial dendritic cells in the thymus that control development of helper T-cells. Monoclonal antibodies to Ia-antigen produced profound immunosuppression when injected in vivo. Repeated inoculation of newborn mice with anti-Ia results in loss of the Ia-antigen bearing Langerhans-like cells in the medulla without effecting Ia-antigen expression of thymic epithelial cells. Furthermore, such treatment selectively reduces development and release of helper T-cells into the periphery without effecting development of suppressor cells or immature thymic cortical cells. Thus helper T-cell development is entirely dependent on functional Ia-antigen bearing Langerhans cells and development of immature T-cells and suppressor cells occurs through interactions with different cells. Noradrenergic and peptidergic fibers enter the thymus with nerve bundles and plexuses around blood vessels, penetrate into the cortex from subcapsular plexuses and branch among lymphocytes in the thymic cortex. The vasculature and lymphatic tissue of the outer and deep cortex are inervated by these fibers. The medulla is remarkably free of innervation except for fibers associated with blood vessels. Neuropeptide antigens are present in varicosities of thymic neurons. Vasoactive intestinal peptide reactive neuronal varicosities and acetylcholinesterase positive profiles are present in the deep cortex and corticomedullary regions, respectively. In vitro studies indicate that T-cell responses can be effected by neurosecretory products and anatomical studies clearly show association of nerve fibers with aggregates of lymphoid cells in vivo. However, the precise relationships of the anatomy and physiology of neuroimmune functions in T-cell development and differentiation remain to be resolved. IS THERE AN ANTIGEN BARRIER IN THE THYMUS? The thymus is widely thought to be an antigenically privileged site, yet antigen is essential for positive selection of specific T cell clones for maturation and release to the periphery, acquisition of MHC haplotype restriction and tolerance induction implies that antigen must be present. A so-called blood-thymus barrier was proposed because of differences in ex vivo antibody formation in thymus fragments after injecting antigen directly into the thymus or after intravenous inoculation. Other scientists used a different antigen but a similar experimental design and found that intrathymic inoculation with antigen resulted in the induction of specific tolerance. BLOOD-THYMUS BARRIER. Studies with tracers of blood vessel permeability showed that cortical thymocytes, in contrast with those of the medulla, are protected from circulating macromolecules. Blood vessels in the thymic cortex were not permeable to the protein tracers, but the poscapillary venules of the thymic medulla permitted traces to leak along the clefts between migrating lymphocytes and endothelial cells. 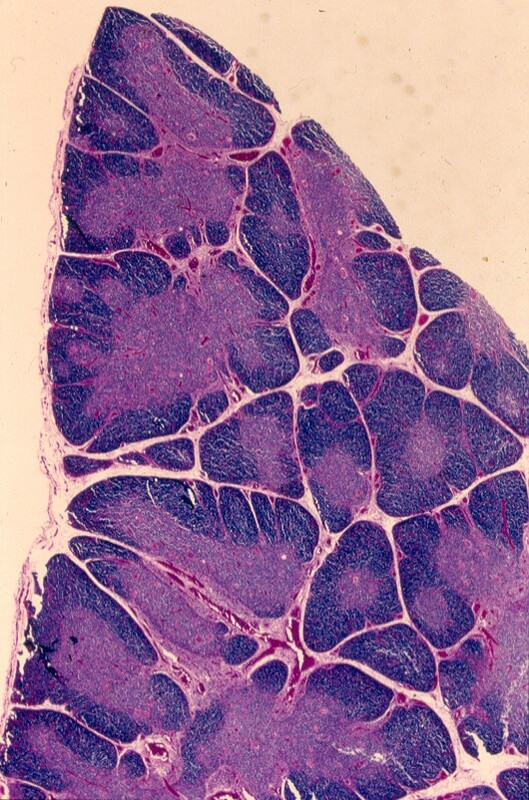 The tracers, which crossed medullary venule walls, had limited distribution in the thymic parenchyma because macrophages in the perivascular space ingest and retain much of the leaked tracer. The phagocytic cells and basal lamina at the border between the cortex and medulla captured any tracer that may have escaped endocytosis in the vessel wall. Thus hematogenous antigen has access, albeit restricted, to the thymic medulla. LYMPH THYMUS BARRIER. Although the thymic cortex has a blood barrier it is freely permeable to particulates or soluble proteins in lymph fluids originating in the peritoneal cavity. Antigens deposited in the peritoneal cavity rapidly pass through diaphragmatic and mediastinal lymphatics and pass through a lymphatic plexus around the thymus. This exposes antigens from the peritoneal cavity to parathymic lymph nodes and and imature T cells in the thymic cortex. The plexus of lymphatics surrounding the thymus capsule seems to allow diffusion of materials into the lymphoid parenchyma of the superficial cortex on a concentration gradient produced by the unique cortical blood vasculature. Soluble antigens deposited in the outer cortex may deliver a tolerogenic signal to developing T-cells. Cell differentiation markers, are valuable in describing the development of mature, functional T-cells. In mice, some marrow stem cells stain faintly for the Thy-l (theta) antigen but do not express CD-4 or CD8 antigens. "Double negative cells that express Thy-l and Jlld markers are apparently ready for differentiation because they can be induced to express markers of mature Tcells in vitro and in vivo. No all double negative thymocytes can be considered T-cell precursors, however. Class I MHC antigens and common lymphocyte antigen (CD-5) are expressed on precursor T-cells throughout intrathymic and extrathymic maturation. Expression of CD-2 (Tll, SRBC receptor) molecules by immature T-cells is believed to facilitate formation of Tcell aggregates and adhesive interactions with thymic epithelial cells through binding with lymphocyte-function associated antigen (LFA-3) expressed on cell membranes. As pre-T cells infiltrate the thymic epithelium they lose surface TL (thymic lymphoma) antigen, express more Thy-l copies and begin to express CD-4 and CD-8 antigens. Double positive (CD-4+, CD-8+) T-cells that express antigen receptor are regarded as immature "cortical" cells that will differentiate into specific accessory T-cells after exposure to antigens and/or help from other T-cells. A proportion of peripheral blood T-cells express both CD-4 and CD-8 indicating that simultaneous expression does not prevent these cells from exiting the thymus. Expression of a single functional phenotype such as CD-4 (helper) or CD-8 (suppressor, cytotoxic) is associated with entry into the thymic medulla, exit to the periphery and inclusion in the recirculating pool. The L3T4 marker (mouse equivalent of CD-4) identifies the helper T-cell and does not react with the Lyt-l antigen on it or any other lymphocyte. Some CD-4 T-cells have been identified that have cellular cytotoxicity as a principal function. The CD-8 (Lyt-2 in mouse) expressing T-cell functions as suppressor cells or are responsible for class I MHC restricted, antigen specific cellular cytotoxicity against virally infected target cells and tumor cells. CD-8 cells are also present in the recirculating pool but cannot be negatively selected from efferent lymph by antigen as are CD-4 helper cells. The CD-8 T-cell is also able to return to the thymic cortex after emigrating while the CD-4+ T-cell is barred from returning unless the thymic perivascular microenvironment is altered as in Myasthenia Gravis. Some CD-8+ and all double positive cells appear to be short-lived because they rapidly disappear from the circulation after adult thymectomy or low level total body irradiation which effects thymic cortical lymphocytes. Acquisition of MHC haplotype restriction is one of the most intriguing aspects of T-cell development in the thymus. During maturation in the Thymus a dramatic selection takes place. Only those T-cell clones that express receptors capable of recognizing antigen in conjunction with the allelic forms of the MHC proteins expressed by thymic epithelial cells (or marrow-derived mononuclear cells) can mature fully. Mature helper T-cells are "restricted" to responding to antigen associated with the class II MHC antigen they saw in the thymic environment regardless of their own genotype. The same is true for mature cytotoxic T-cells who must recognize the class I MHC antigens, they saw during development, simultaneously with the viral or tumor antigen in order to deliver the lethal hit. Specificity for the foreign antigen is not sufficient to activate the respective T-cell if the antigen is expressed on an antigen-presenting-cell or target cell thathas MHC antigens different from those that were seen during intrathymic development. The T-cell antigen receptor is analogous to membrane immunoglobulin in B-cells. The T-cell receptor is composed of two polypeptides (alpha, beta or gamma, delta ) associated in the membrane with CD3 and a number of accessory molecules such as CD4/CD8 and CD2. The T-cell receptor complex binds to immunogenic peptides only if they are presented within MHC antigens of antigen presenting cells or target cells. "Processed and presented" antigens are bound in a cleft lined by the polymorphic regions of the MHC antigens (Bjorkman et al 1987) which forms them into "recognizable" 10 angstrom alpha helices. At the gene level, the alpha and beta chain genes are like immunoglobulin heavy chain genes where variable, diversity, joining and constant gene segments are rearranged prior to expression of the protein on the T-cell membrane. This genetic rearrangement and expression is believed to occur after the pre-T cell arrives in the thymus and before it leaves for the periphery. Unlike immunglobulin, the T-cell receptor for antigen cannot effectively bind antigen except in the context of MHC gene products expressed on accessory target cells.